Facts and information about the History of Clothing and regalia of Native American Indians and their Feather Headdresses. 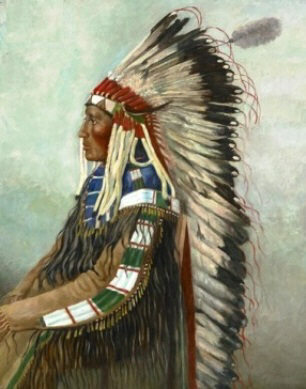 The image of the Feather Headdress are instantly associated with the clothing and culture of Native American Indians. There were several different types of headdresses worn by different Native Indian tribes including the long, trailing feather headdresses worn by the Sioux and the Cheyenne, the straight-up headdress worn by the Kiowa and the Comanche, the halo feather headdresses worn by the Hidatsa tribes and the Blackfoot and the feather crowns and plumes worn by the Californian Shasta and Chumash Tribes.